Quixote’s West Side art mural. 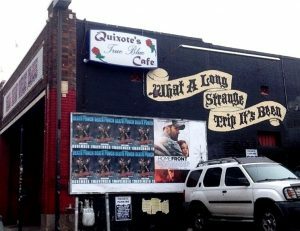 Another one bites the dust: Deadhead bar Quixote’s will host its last shakedown tonight with Pink Floyd/Talking Heads/Phish coverband Pink Talking Fish. If you’re wondering if the venue will have life after The Dead, wonder no more. On November 19th, the space at 314 East 13th Avenue will reopen as The Black Box, a dance club that will feature events organized by Denver dubstep collective Sub.mission. The Black Box is Denver’s newest hot spot for underground music. Custom fit with Basscouch sound, we are ready to rumble! Dylan Owens is co-editor of The Know and music editor of the Denver Post. A former baby model, he spends most of his money on music and club sandwiches.